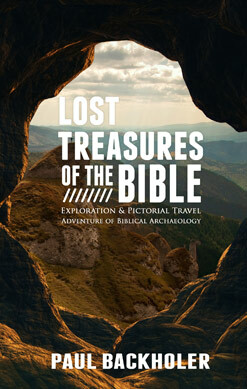 Join a photographic quest in search of the lost treasures of the Bible. Unveil ancient mysteries as you discover the evidence for Israel’s exodus from Egypt, and travel into lost civilisations in search of the Ark of the Covenant. Explore lost worlds with over 160 colour pictures and find how evidence outside of the Bible gives a deeper insight into the mysteries of ancient Israel. Learn what happened to the treasures of the Temple of Jerusalem and experience an onsite travel journal through Egypt, Sudan and Ethiopia. Paul Backholer is a British broadcaster and the founder of ByFaith Media. He is the director of ByFaith Television which airs on multiple platforms around the world and is the producer of several Christian documentaries. Paul is the author of a number of books including Heaven – A Journey to Paradise, How Christianity Made the Modern World, The Exodus Evidence and The Ark of the Covenant - Investigating the Ten Leading Claims. Paul studied in a British Bible college and has travelled to over forty nations.